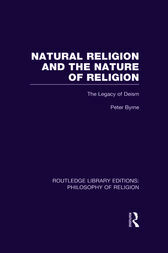 This study offers students of religion and philosophy introductory chapters concerning the concept of natural religion. It holds that we can’t engage in useful discussion about the present concept of religion without a knowledge of the philosophical history that has shaped that concept. This is discussed with reference to the notion of natural religion to illustrate certain aspects of deism and its legacy. Originally published in 1989.